GALION — The Galion Lady Tigers basketball program hopes that 2017-2018 is the year that the streak is snapped. Head coach Nick Vukovich will return for his third season as the leader of the Lady Tigers and owns a 9-34 record in Galion and 17-75 overall. In Vukovich’s tenure in Galion, his girls squad is winless in Mid-Ohio Athletic Conference games (0-26). In fact, since joining the MOAC for the 2014-2015 season, the Lady Tigers are 0-39 in the difficult conference. With the loaded MOAC challenge ahead of them, Vukovich remains positive. 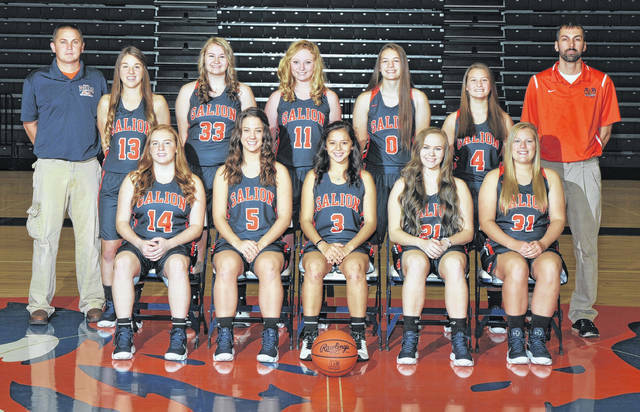 Galion will hit the courts without the presence of Dani Schieber on the interior, the outside shooting of Lauren Huggins and the all-over presence of Jaime Ehrman. Those three hoopsters are now Galion alums after graduating last spring. Returning for coach Vukovich will be Julie Clouse, a healthy Gracie Groves and Gabby Kaple. Kaple, entering her junior season, was an honorable mention on the District VI team and a second-team all-MOAC player last winter for the Lady Tigers. In addition, Vukovich says to keep an eye out for newcomer Mykenzie Debord. 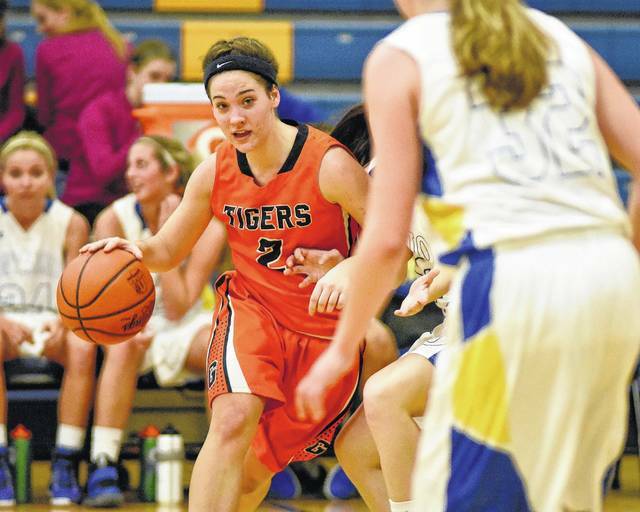 The winter trek will begin for the Lady Tigers began on the road at Crestline on Nov. 24. MOAC play will open up with a tall order as the Galion squad will load onto the bus and head to Marion for a clash with the Pleasant Lady Spartans on Thursday, Nov. 30. Photo courtesy Photorama of Galion 2017 Galion High School girls basketball team Don Tudor | Galion Inquirer file photo Galion’s Julie Clouse brings the ball across the center line against Ontario’s press during a 2016 game. Clouse is one of the leaders on the Lady Tigers this season. https://www.galioninquirer.com/wp-content/uploads/sites/38/2017/11/web1_Girls-varsity-basketball.jpgPhoto courtesy Photorama of Galion 2017 Galion High School girls basketball team Don Tudor | Galion Inquirer file photo Galion’s Julie Clouse brings the ball across the center line against Ontario’s press during a 2016 game. Clouse is one of the leaders on the Lady Tigers this season. Galion’s Julie Clouse brings the ball across the center line against Ontario’s press Tuesday at Ontario. Photo by Don Tudor. https://www.galioninquirer.com/wp-content/uploads/sites/38/2017/11/web1_inquirer-011717j-GHS-at-Ontario-gbb_0080_b.jpgGalion’s Julie Clouse brings the ball across the center line against Ontario’s press Tuesday at Ontario. Photo by Don Tudor.